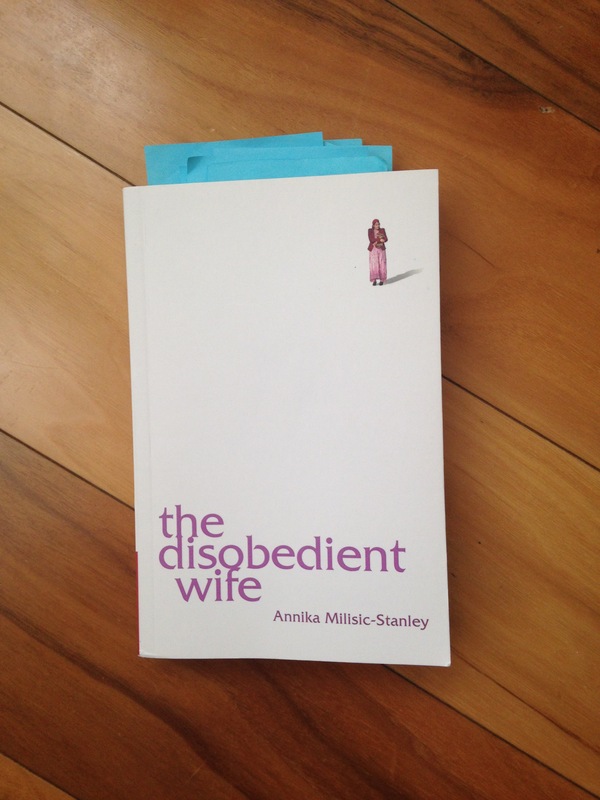 Literary Wives: The Disobedient Wife – The Bookshelf of Emily J. A disobedient wife, in the context of contemporary Tajikistan, is a wife who wants autonomy and acts on it. The Disobedient Wife (2015), beautifully written if somewhat disjointed in the transitions through time, is a strong statement of what women need and want in order to exercise their agency. We see this theme through the two main female characters of Annika Milisic-Stanley’s book, Nargis and Harriet. The Disobedient Wife is the June read for the Literary Wives Series, hosted by these bloggers. Nargis is a local woman in Dushanbe who must work to make ends meet. She was married to her sweetheart, but he died of cancer, leaving her with two children. She remarried at the urging of her parents, but her new husband, Poulod was abusive to her and her children. She had a baby with him, and attempted to leave, but he stabbed her in the back with scissors, traumatizing her older children. She ended up leaving for good, but had not obtained a divorce and her youngest baby with Poulod stayed with his father and grandparents. She misses her baby. Poulod makes matters worse by becoming a drug mule and trying to convince her and the children to join him. He is rich because of it and thinks this will impress Nargis. He does not realize that she isn’t an object to be bought or controlled. She must hide from him for several weeks because of the dangerous people he works with. Her work to make ends meet includes opening her own shop and nannying for a British woman named Harriet, who is the second wife of a rich and traveling diplomatic employee of some sort. Harriet, the expatriate wife, is seemingly privileged and free because of money and status. Nargis first describes her as “[w]ilfully ignorant of hardship and poverty . . . she seemed to care for no one except her children, her husband, and, of course, herself” (p. 23). However, Harriet is also tortured by her relationship with men. Her husband is cheating on her, and she is unhappy being with their young children all day in a country she doesn’t like. She constantly asks her husband to move them elsewhere, to return to England, but he will not consent to it. Eventually, he does agree, but Harriet learns it is because he has ended an affair with another woman and wants to run away. She is angry and decides to return to England, back to home and family for comfort. When her husband is injured in a bomb explosion, she is at his side again in the hospital, hoping that the incident will bring them together. It seems she is ready to forgive. However, his mistress shows up as well, very pregnant, and Harriet knows she is done and that she can release herself from the psychological stress of her marriage. These two women face very different situations, culturally, emotionally, and economically; however, the two women bond over the course of the novel. They come to depend on each other; Harriet supports Nargis’s ventures financially while Nargis supports Harriet emotionally. The two women find commonalities in their experiences and their feelings about what it means to be a wife. They both feel trapped, physically and metaphorically, and they come to depend on each other. Harriet tells Nargis, when she learns of her circumstances and the scar she carries from being stabbed by her husband, that “What you’ve been through is nothing to be ashamed of. In the U.K. we’d call you a ‘Survivor’” (p. 131). Yet their first interactions with each other are wary and stifled. Harriet feels pressure from her husband not to feel anything for or mingle with the “servants.” Nargis sees Harriet as wealthy and uncaring. She cannot take Harriet’s problems with boredom and a busy husband seriously because Nargis’s problems are more pressing and “real.” In her diary, which gives us insight into Harriet throughout the novel, Harriet wrote, “I miss being good at something aside from cooking and adorning my husband’s arm” (p. 24). Yet Nargis is struggling to keep food in her children’s mouths and cannot see her youngest child because of her husband’s control. The women’s circumstances and their views tend to reflect the divide between the feminism(s) of white, Western women and the multicultural feminism(s) of women of color. The reality of wives’ subordination within Tajik culture is highlighted through another woman. Nargis partners her business with Savsang, the wife of the town’s mullah. Savsang is young and beautiful and her marriage was arranged. Her husband is respected and educated, but he is also old and controlling. When he finds out that Savsang had an affair, he beats her, keeps her locked up, and she eventually kills herself. It is a sympathetic and nuanced story about women’s autonomy, women’s sexuality, and the control men have because of tradition and culture. When Nargis worries about Savsang and laments her fate, Nargis’s mother Gulya says sternly, “You are too soft . . . All husbands hit their wives, especially when they find out they are cheating on them. And they deserve it too. You know the old saying. My mother used to repeat it over and over when I came to her weeping in the early days of marriage: ‘Nobody beats a good wife who is obedient’” (p. 82). Similarly, “Many had been dismissed by police officers who told them, ‘Go home and be better wives’” (p. 229). These ideas illuminate the title of the book, that the women who find autonomy and strength and the will to move on and refuse to accept abuse are “disobedient.” However, the lesson is that it may be more desirable and better for women and children if women embrace disobedience. The culture is one of victim-blaming, where women are told to accept punishment and act better to avoid further abuse, yet men are never held accountable for their unfair actions or ridiculous violence. In this frame, to be a wife is to be a victim and to be responsible for it. However, the women in this book change that and move outside of the expectations to embrace “disobedience” and ultimately autonomy. The book is a fascinating read because of this tension in marriage, but also because of the insight into another country. We learn of its seasons, its cultures, its socioeconomic divides, its food, its customs, its problems, its history, and more specifically, its relationship to Soviet Russia, from which it is still recovering. While much of this information is different and new and interesting to those of us from other contexts, the story that happens in this “strange” land is all too universal. It is a story of women being abused and betrayed by men. It is a story of women fearing because of men. It is a story that should not exist. But it does. And it always has. And Milisic-Stanley tells it well. Have you read “The Good Chinese Wife?” It is a 2014 title and one of the comparable titles I use when querying agents. I have a lost about this book and “The Good Shufu.” I was a Japanese wife for 17 years and I do quite q bit of posting about that experience. How interesting! I have not read it. I’ll look into it. Thanks! Thanks, Keith! This was definitely an informative read and I’m glad I had a chance to learn more about Tajikistan. Wonderfully put, Emily! I love your last two lines.And, I like the idea that they have ’embraced’ disobedience, and this is what saves them. I’m glad you included the story of Savsang – it was a powerful way of illustrating this part of Tajikistan’s culture. I also found that part of the book interesting. I’ve never read about Tajikistan before. So glad we read this book! I know. This was a great book! I’m glad we read it too. And yes, Savsang I think represented what all-too-commonly happens to women in these situations. She was more of the representative woman, while I think Nargis and Harriet were exceptions given that they could rise above somewhat more easily. Yes, good point about Nargis and Harriet being the exceptions! Many women (like Savsang) are not in a position to get themselves out. Thank you for taking the time to write this great review and for reading my book so thoroughly. I loved the read! You are a talented author and I look forward to reading more. Thanks for reaching out and telling me about your book. Do you think Harriet knew Henri was cheating on her? I thought it was relatively obvious that he was but that Harriet didn’t realize it. I liked some of the quotes you highlighted, because they were ones that struck me at the time, ones that perpetuate the idea in different cultures of what men’s roles are and women’s roles, but that are not true (like “no one beats a good wife.” The only my mother used to tell me was how much harder it was to be a man than a woman. How can that be, when men have most of the power? I don’t think she knew until the end, when there is a big scene. It was fairly obvious, given his long trips and such, but I think she didn’t know. No, I didn’t either, but I asked because it sounded like you thought she did. I guess you were just summarizing. Nicely done, as usual, Emily! This type of story certainly should not exist, and yes, it does. I thought this was well-written! Thanks! I liked the forward movement of this novel as well, and that the women bonded. It was my first read of a book set in Tajikistan as well! I hadn’t even heard of Tajikistan before I read your review of this book! It really was a good read and definitely informative. I was impressed with this one!